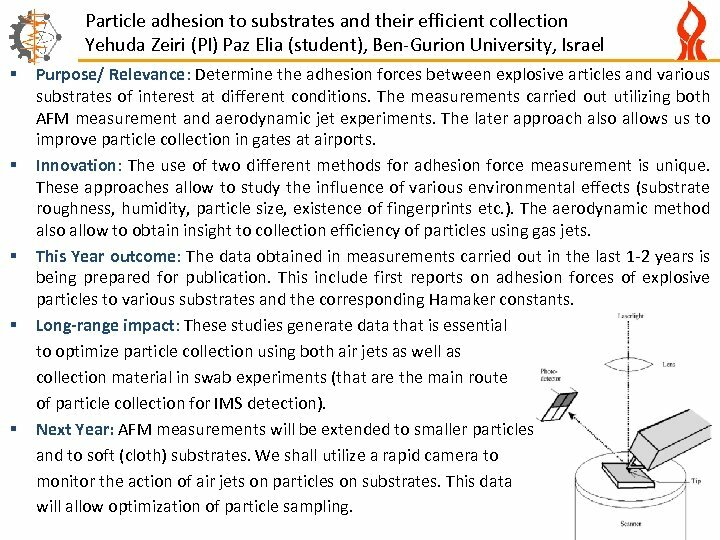 Particle adhesion to substrates and their efficient collection Yehuda Zeiri (PI) Paz Elia (student), Ben-Gurion University, Israel § § § Purpose/ Relevance: Determine the adhesion forces between explosive articles and various substrates of interest at different conditions. The measurements carried out utilizing both AFM measurement and aerodynamic jet experiments. The later approach also allows us to improve particle collection in gates at airports. Innovation: The use of two different methods for adhesion force measurement is unique. These approaches allow to study the influence of various environmental effects (substrate roughness, humidity, particle size, existence of fingerprints etc. ). The aerodynamic method also allow to obtain insight to collection efficiency of particles using gas jets. This Year outcome: The data obtained in measurements carried out in the last 1 -2 years is being prepared for publication. This include first reports on adhesion forces of explosive particles to various substrates and the corresponding Hamaker constants. Long-range impact: These studies generate data that is essential to optimize particle collection using both air jets as well as collection material in swab experiments (that are the main route of particle collection for IMS detection). Next Year: AFM measurements will be extended to smaller particles and to soft (cloth) substrates. We shall utilize a rapid camera to monitor the action of air jets on particles on substrates. This data will allow optimization of particle sampling. 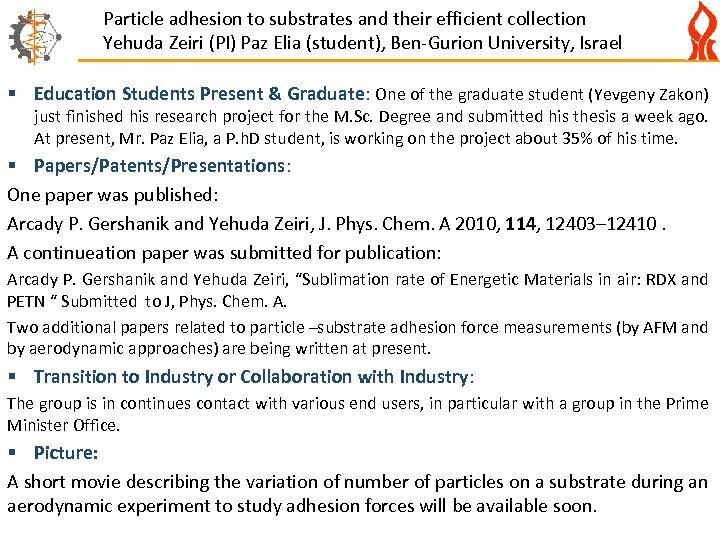 Particle adhesion to substrates and their efficient collection Yehuda Zeiri (PI) Paz Elia (student), Ben-Gurion University, Israel § Education Students Present & Graduate: One of the graduate student (Yevgeny Zakon) just finished his research project for the M. Sc. Degree and submitted his thesis a week ago. At present, Mr. Paz Elia, a P. h. D student, is working on the project about 35% of his time. § Papers/Patents/Presentations: One paper was published: Arcady P. Gershanik and Yehuda Zeiri, J. Phys. Chem. A 2010, 114, 12403– 12410. A continueation paper was submitted for publication: Arcady P. Gershanik and Yehuda Zeiri, “Sublimation rate of Energetic Materials in air: RDX and PETN “ Submitted to J, Phys. Chem. A. Two additional papers related to particle –substrate adhesion force measurements (by AFM and by aerodynamic approaches) are being written at present. § Transition to Industry or Collaboration with Industry: The group is in continues contact with various end users, in particular with a group in the Prime Minister Office. § Picture: A short movie describing the variation of number of particles on a substrate during an aerodynamic experiment to study adhesion forces will be available soon.